So you've read the classic book & you've watched the tv show, why bother with a graphic novel; adaption you may be asking yourself? Well Nault takes full advantage of the power of sequential art and delivers a whole new experience for the timely dystopian tale. With this stunning graphic novel adaptation of Margaret Atwood’s modern classic, beautifully realized by artist Renée Nault, the terrifying reality of Gilead has been brought to vivid life like never before. Everything Handmaids wear is red: the colour of blood, which defines us. 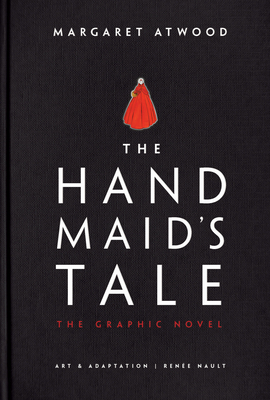 Offred is a Handmaid in the Republic of Gilead, where women are prohibited from holding jobs, reading, and forming friendships. She serves in the household of the Commander and his wife, and under the new social order she has only one purpose: once a month, she must lie on her back and pray that the Commander makes her pregnant, because in an age of declining births, Offred and the other Handmaids are valued only if they are fertile. But Offred remembers the years before Gilead, when she was an independent woman who had a job, a family, and a name of her own. Now, her memories and her will to survive are acts of rebellion. MARGARET ATWOOD, whose work has been published in thirty-five countries, is the author of more than forty books of fiction, poetry, and critical essays. In addition to The Handmaid's Tale, her novels include Cat's Eye, short-listed for the 1989 Booker Prize; Alias Grace, which won the Giller Prize in Canada and the Premio Mondello in Italy; The Blind Assassin, winner of the 2000 Booker Prize; Oryx and Crake, short-listed for the 2003 Man Booker Prize; The Year of the Flood; and her most recent, The Heart Goes Last. She is the recipient of the Los Angeles Times Innovator's Award, and lives in Toronto with the writer Graeme Gibson. Renée Nault is a Canadian artist, illustrator, and graphic novelist known for her vivid watercolor and ink illustrations. Her work has appeared in books, magazines, newspapers, and advertising around the world. She is a frequent illustrator for the Los Angeles Times. Please visit www.reneenault.com. "Haunting . . . Impossible to look away from."